Are you looking for a wedding vendor and supplier directory or portal that combines vendor and couple features? WeddingCity could be the best wedding business directory WordPress theme. It is a fully responsive theme which means it scales perfectly on mobile and any devices. 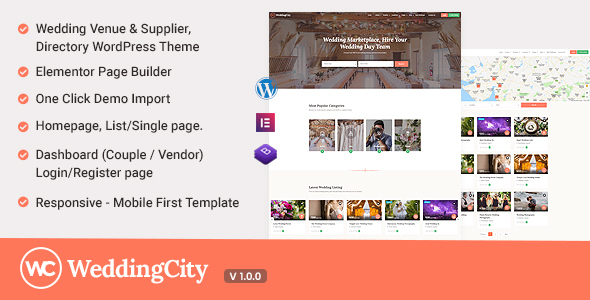 WeddingCity built with high-performance page builder plugin for WordPress. Elementor is the fastest page builder ever. It’s real-time and instant process. WeddingCity theme helps you to create, manage and monetize a directory site for wedding purpose. Make money from your website by charging for listing submission. Create different listing submission packages. Set unique prices for each package. Paypal – Fast, secure payment gateway that could be trust. Import one click demo and start editing it right away. Easily manage theme options or content from admin area. Listing features, pricing, etc..